Influenza – flu – can be a very serious illness. It causes the death of thousands of Americans, most of them elderly, every year. Being vaccinated against the flu can significantly reduce your chances of getting the flu, according to the Centers for Disease Control, or CDC, which offers some guidelines for getting a flu shot. First, it is important to note that getting a flu shot does not guarantee you will not get the flu. There are many different strains of the flu virus. Each year, researchers determine the three strains likely to be most common in a particular flu season; those strains are used to create that season’s flu vaccine. But while it is possible that you could be exposed to a different strain, you still have much more protection with the shot than without. You also could contract the flu before the shot has fully taken effect. The vaccine takes about two weeks to become fully effective, so the CDC suggests you get vaccinated as soon as vaccines become available. Flu season can begin as early as October, and once there is a lot of flu in your area, it could be too late to protect yourself. It also is important to note that the flu shot cannot cause you to develop the flu. People with certain medical conditions, including asthma, chronic lung disease and diabetes. People who are age 65 or over. People who live with or care for someone in the high-risk population. People with a severe allergy to chicken eggs. People who have had a severe reaction to flu vaccine in the past. Babies younger than 6 months old. People who are sick and have a fever. They should wait until they have recovered to be vaccinated. People with a history of developing Guillain-Barre Syndrome after receiving a flu vaccine; if you have had such a reaction, talk to your doctor about whether you should be vaccinated, especially if you are in a high-risk group. Generally, reactions to the flu shot are mild. They can include a soreness around the injection site, usually the arm. If you develop other reactions, contact your doctor. 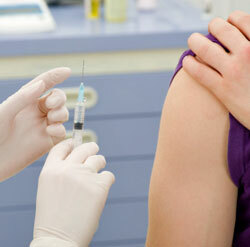 Many insurance plans cover the cost of flu shots. If your insurance does not cover the vaccine, look for a free flu shot clinic in your area.